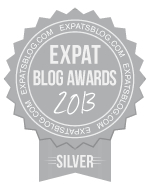 ExpatsBlog.com Expat Blog Awards 2013: Spain Silver Award! This blog won the Silver Award for best expat blog in Spain! I loved this blog because she really goes into details on things you will need if you were to live abroad Spain! Not only does she give advice on what you'll need but then she gives you what you can do to make your life easier in Spain!! !